You might not think you need to read this because your baby is still small, or because your older child is so huge you can’t possibly imagine carrying them, but read it anyway, it is about you. The baby will grow, and that big kid of yours you struggle to lift still needs you. We carry our children throughout our lives, literally, then figuratively – we carry their cares, their worries, we carry them as responsibility, out of love. They are the roots that keep us upright yet burden our shoulders, they are the constants that are always there but will one day leave. I am often greeted with surprise or mild horror when I let library users know the weight or age limits of the carrier they have chosen. It is hard to imagine, when your baby is small, how big they will become, and how you will feel about them when they do. It is hard to imagine being comfortable carrying larger weights. And for some, it is hard to step outside the situation and separate the two words in the term ‘baby carrier’ – to be carried does not mean you are a baby. To carry an older child is not to infantilise them, or to pander. Yes, for sure they can walk by then. For definite, they should stand on their own two feet. They will. And they do. But carrying an older child has less and less to do with the actual transportation of the child and more and more to do with the relationship between you. Children do not become so overnight. It may seem like the blink of an eye but each day they grow a tiny bit more, and if you carry them each day, each week, each month, you absorb the changes with your own strength. Pick up someone else’s toddler when you have a new-born and they seem huge, heavy and clumsy. Pick up someone else’s toddler when yours is at school and they seem compact, tiny and cuddly. There is no magical age where everybody stops picking up their child, it’s a gradual process that will change for each parent-child pairing depending on many factors. And there is certainly no arbitrary cut off point for hugs. With a much older child, most of the time using a carrier is merely giving them a hug, a need that hopefully nobody would deny. Is it necessary to use a carrier? Of course not. Is it sometimes nice? If it works for you, it can be lovely. 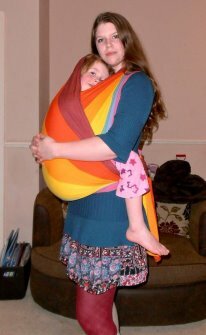 Using a carrier for physical contact with an older child is different to just giving them a cuddle. The carrier holds them, tight, close, enveloping them in a way nothing else can. And there is no pressure, no expectation, being carried is passive, they do not have to do anything, they do not have to cuddle back, there is no time to pull away. For a moment they can merely sit, be still, be close, and not worry that you will just pop off to do something else or be somewhere else. For a moment, they have you, all to themselves. And that is why it is valuable. I carry my children when they are newborn and need to be close to my body, I carry them when they are babies and I show them new things and places, I insist they go up as tantrumming toddlers in need of a nap, and I give them lifts as a pre-schooler when their legs are all run out. And now, on those very few occasions, when my biggest girl asks to go into a carrier, I will say yes. Sometimes it is a laugh and a joke, to try something new, but sometimes it is her last retreat when all the world thinks that because she is 4ft tall she is 4/5ths of an adult. Do not worry that if you carry your child when younger they will somehow ‘expect’ it when they are older, this does not follow. Do not worry that carrying your child and fulfilling their need for touch will spoil them. Carrying is merely a tool for parenthood that you can employ at any of these stages, if you so choose – or not. There is no right, no wrong, whether you carry for a day, a year, or as long as you both please. It is unlikely that an older child will want to be carried for very long. It is unlikely that they will want to be carried purely for transportation purposes. It is even unlikely to happen very often. But when it does, it will not spoil them, or lose them the use of their legs, it will not break your back or make them a baby. It will hold them close then let them go, just as we are designed to do. 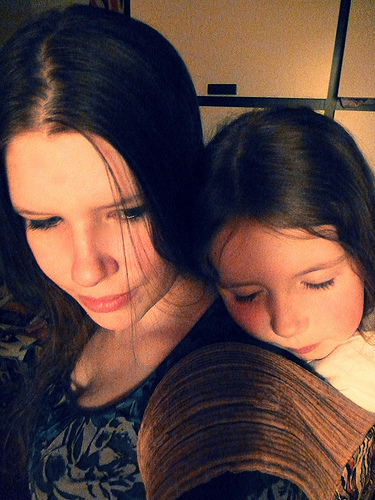 Lovely post, I hope I can keep wearing my son for many months, if not years. As he learns to toddle, cuddles have become a real treat for me in a way I could not have imagined when he was a newborn heavy in my arms. Popping him in a sling keeps him content while I get to squeeze him and sniff his baby hair to my heart’s content. beautiful article, i had not thought that way about carrying, i had just been thinking it of a method of transportation when my baby will not go into the pram. My son is 3 months old and as you put above, when he is in my arms he is passive and he knows that i’m not going anywhere. That he has me all to himself. I imagine that is why he prefers the sling to the pram! In this very busy society where we all rarely have a moment to just sit down with our children to do nothing but love them…. i imagine that just being with them and not going anywhere else as important to a 3 month old as it is to a young child.